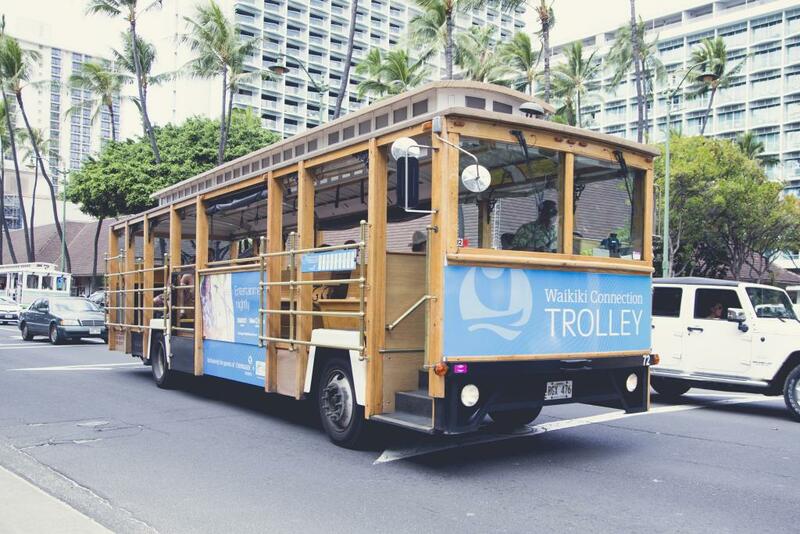 Set on the sands of the world famous Waikiki Beach, Outrigger Reef Waikiki Beach Resort is surrounded by tropical gardens and is within minutes of the International Airport in Honolulu Airport and a range of local shopping, dining, entertainment and attractions. 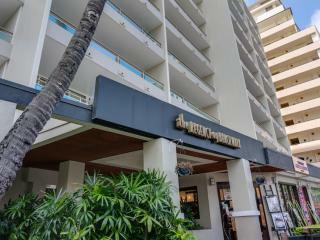 Outrigger Reef Waikiki Beach Resort features over 630 guest rooms, apartments and suites which enjoy a modern range of amenities including free WiFi, flat screen LCD TVs, air conditioning and some featuring private balconies with city, beach or ocean views. 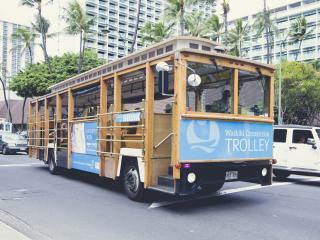 This accommodation in Honolulu is ideal for a relaxing holiday in Hawaii. Outrigger Reef Waikiki Beach Resort offers a fantastic variety of facilities including a pool bar, swimming pool, day spa, variety of restaurants, a fitness centre, an activities centre, gift shop, business centre and more. Offering an unbeatable location and great value for money, you can't go past Outrigger Reef Waikiki Beach Resort on your next holiday, wedding or romantic getaway in Hawaii. Accommodation at Outrigger Reef Waikiki Beach Resort offers 635 spacious guest rooms, most of which feature a private lanai or balcony with fantastic views of downtown Waikiki, the beach or the ocean. City View 1 King Bed: Take in stunning views of Waikiki city or pool from the private balcony. Room size is 32m². Bedding is 1 King Bed. Maximum room capacity is 4 Adults & Children. 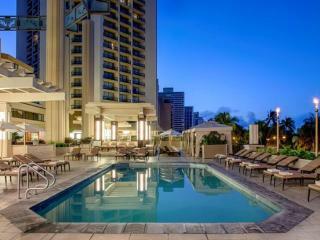 City View 2 Double Beds: Take in stunning views of Waikiki city or pool from the private balcony. Room size is 32m². Bedding is 2 Double Beds. Maximum room capacity is 4 Adults & Children. Partial Ocean View 1 King Bed: Wake up to partial views of the glistening waters of Waikiki Beach. Room size is 33m². Bedding is 1 King Bed. Maximum room capacity is 4 Adults & Children. Partial Ocean View 2 Double Beds: Wake up to partial views of the glistening waters of Waikiki Beach. Room size is 33m². Bedding is 2 Double Beds. Maximum room capacity is 4 Adults & Children. Pacific Tower Ocean View 1 King Bed: Bedding is 1 King Bed. Maximum room capacity is 4 Adults & Children. Pacific Tower Ocean View 2 Double Beds: Bedding is 2 Double Beds. Maximum room capacity is 4 Adults & Children. Ocean Tower Ocean View 1 King Bed: Bedding is 1 King Bed. Maximum room capacity is 4 Adults & Children. Ocean Tower Ocean View 2 Double Beds: Bedding is 2 Double Beds. Maximum room capacity is 4 Adults & Children. 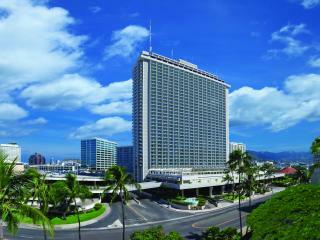 Family Suite 1 King Bed: Located in the Pacific Tower, take in stunning views of Waikiki city from the private balcony. Room size is 67m². Bedding is 1 King Bed. Maximum room capacity is 5 Adults & Children. Family Suite 2 Double Beds: Located in the Pacific Tower, take in stunning views of Waikiki city from the private balcony. Room size is 67m². Bedding is 2 Double Beds. Maximum room capacity is 5 Adults & Children. Club Ocean Front 1 King Bed: These prime location rooms are directly above the beach where the shifting sand and sounds of the ocean can be heard throughout the day. Room size is 37m². Bedding is 1 King Bed. Maximum room capacity is 4 Adults & Children. Club Ocean Front 2 Double Beds: These prime location rooms are directly above the beach where the shifting sand and sounds of the ocean can be heard throughout the day. Room size is 37m². Bedding is 2 Double Beds. Maximum room capacity is 4 Adults & Children. Kani Ka Pila Grille: Enjoy breakfast, lunch and dinner at this casual poolside restaurant serving tropical drinks and hors d'oeuvres accompanied by island music. The Reef Bar & Market Grill: Open daily for breakfast, lunch and dinner. Offering a beachfront dining experience where guests can select fresh farm to table ingredients, interactive 4 star dining experience. Offers fresh fish market, premium steaks and a raw bar. Hours of operation are subject to change. Starbucks Coffee: Located on the lobby level, serving specialty coffees and a variety of pastries throughout the day. Voyager 47 Club Lounge: Guests staying in Club rooms and suites at Outrigger Reef Waikiki Beach Resort are offered exclusive access to the Voyager 47 Club Lounge. This includes daily full breakfast, evening appetizers and select beverages including wine, local craft beer and signature cocktail. All club room guests include waived daily Waikiki connection charge. La’aKea Spa Hawaii: Experience a true Hawaiian sense of rejuvenation and let the true spirit of aloha soak in with a range of massages and spa treatments using exotic tropical oils, plant extracts and essential oils. Open daily from 10am to 6pm, located on the second floor of the Diamond Head Tower. Imagine a picturesque scene of waves crashing on the beach while you and your guests enjoy an intimate, tented reception on the Voyager Deck. Located three stories above the beach , this open air deck creates a magical scene with magnificent ocean views and a romantic ambiance. Children: 0-17 years are free of charge in existing bedding when sharing with parents. We loved having breakfast at the beach side bar and pre-dinner drinks.